Due to increasing demand, we are now offering additional dates to attend the Legal Lean Sigma Institute instructional courses in Process Improvement and Project Management. The highly interactive, experiential-learning courses combined lecture with hands-on experience to illustrate the effectiveness of the tools and methodologies. Our past attendees have cited the practicality of the course, the benefit of collaborating with others facing similar challenges, and the variety of perspectives we and other participants share -- these courses are ideal for law firm partners, law firm associates, finance professionals, marketing & business development professionals, corporate General Counsel, in-house counsel, procurement professionals, and both novice and experienced practitioners of either project management or process improvement. While most of our work is customized and delivered privately to law departments and law firms, these pubic open-enrollment courses provide a great opportunity to see the ideas in action, to interact with similarly situated colleagues facing the same resistance and catalysts to change, and to gain a better understanding of how and at what pace to roll out such an initiative in your organization. Our next open enrollment white belt certification course is a one-day workshop, held in Los Angeles on May 24, 2016, and hosted by the law firm of Greenberg Glusker. Our next open enrollment yellow belt certification is a two-day workshop, held in Boston on July 26-27, 2016, and hosted by Suffolk Law School. For more details on costs and registration, click here. For more information on process improvement and project management, click here and here and here. One of the most iconic and memorable advertising slogans was developed by the Florida Orange Growers Association to expand interest in orange juice from a breakfast drink to an all-day drink. "Orange Juice - It's not just for breakfast anymore." This slogan came to mind recently after I conducted a project management and process improvement workshop for nearly 100 in-house counsel. The program provided an overview of key concepts along with opportunities for attendees to begin applying the learnings to their own particular law department challenges. One section was devoted to collaboration with outside counsel, with the underlying rationale that few law departments operate in isolation. Sooner or later, in-house counsel will need to rely on outside counsel, so we'd better understand how best to communicate in order to maximize the collaboration. Indeed, some of the most effective and impactful workshops occur when both in-house counsel and their outside counsel representatives come together at the same table. A handful of in-house counsel offered feedback after the workshop that the trend in their organizations is to keep more I work in-house, so they suggested we de-emphasize the need for collaboration with outside counsel. This trend has been widely reported elsewhere. Trouble is, this is not a sustainable trend. Yes, of course, there is some legal work that is more effectively managed in-house. There is also some work that doesn't need to be handled by the legal department at all. And there is a great deal of legal work that can benefit from treating it like it isn't the first time we've encountered it. Ron Friedmann and I will be exploring this as part of our #DoLessLaw panel at the upcoming ILTA conference. But, and let me be gentle here to any potential empire builders, there is no way most CEOs will agree to a long-term shift of outside counsel spend to in-house counsel spend. Businesses make products or deliver services. The good ones have a narrow focus and develop significant expertise in their core competency. For some, it's a unique product feature; for others, it's a business process, like a lean supply chain or a global distribution infrastructure. But one thing is certain -- doing legal work is far from the organization's core competency. That's not to say the in-house legal department, if one exists, does a poor job. In fact, oftentimes quite the opposite is true. A small group of lawyers takes on an astounding array of legal topics every day with efficiency. But growing the legal department is not an area of strategic priority for the CEO. We want to be good at it and not waste money but nor do we want to spend a single dollar or Euro or Pound more than necessary to achieve the desired results. For every law department that is in-sourcing legal work in order to exploit efficiencies and save money, there's a law department that five years ago in-sourced and now a new CEO has determined that the organization can save on its carrying costs by outsourcing non-core functions, like legal work. Many law firms exist solely because companies don't want to do legal work when an equivalent investment in new product innovation can generate far greater returns. So collaboration between in-house counsel and outside counsel is here to stay. 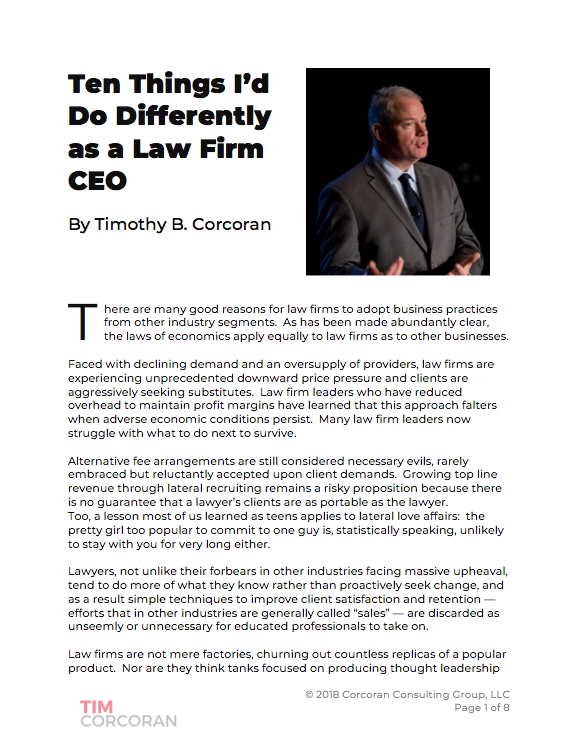 But I'm astounded to learn how few organizations have a systemic, sustainable, measurable program of collaboration between in-house counsel and outside counsel, let alone between in-house counsel and the internal clients who rely on them. We need to fix this. We can talk all day long about developing a philosophy of continuous improvement, and we can all attend process improvement and project management workshops, but until we do this together, with all stakeholders represented, we won't maximize the benefits of our collaboration. With that in mind, the good folks at CounselLink asked me to offer some suggestions for how in-house counsel and outside counsel can approach collaboration, beyond merely working on a legal matter together. Jump over to the CounselLink Business of Law blog for "7 Creative Ideas to Kick Start Collaborative Legal Conversations." And while you're at it, go ahead and share some of your own. After all, we're all in this together. Collaboration -- it's not just for breakfast anymore.